I’ve had an on again, off again relationship with camping my whole life. My (brave) parents took all four of us kids camping every single summer for as long as I can remember. And I’m not talking weekend camping, I’m talking 2-3 weeks at a time with no showers, no flushing toilets, no fancy RV. I loved it as a young kid, hated it as a moody teenager, and now I’m back to loving it as an adult. Looking back, I’m so incredibly grateful to them for giving us those amazing, natural, old school, get-outside-and-breathe-that-fresh-air kind of experiences. Just don’t tell them I said that. You CAN eat healthy and keep up with your balanced lifestyle while camping with minimal preparation, and still leave room for some treats here and there. My husband and I just finished a 5 day road trip to Banff and Jasper, British Columbia, and I promise you we didn’t climb mountains with hot dogs and muffins in our bellies. 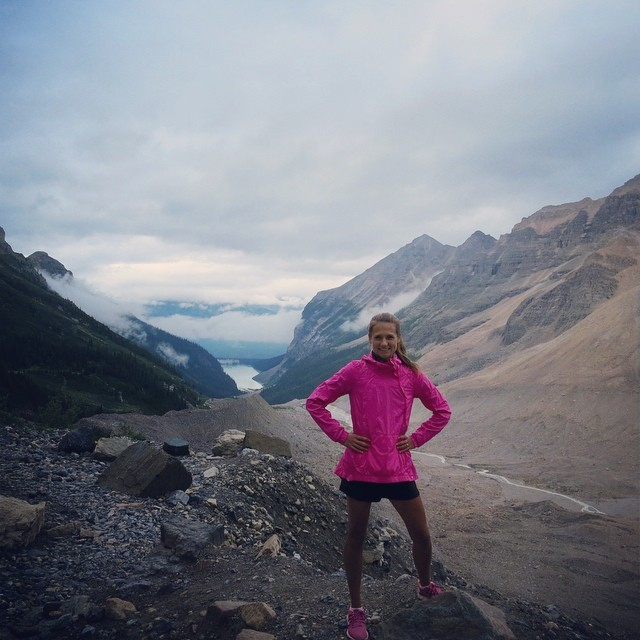 Here’s what I packed and how we enjoyed our adventures, completely guilt free. We dropped our kids off with my parents and left late in the afternoon and drove straight to Golden, BC. We ate before we left and then snacked on veggies, hard boiled eggs, and meatballs for a quick dinner in the car. The next morning we left early to finish our drive and had a similar meal for breakfast in the morning, eating the sausage patties instead of meatballs. (Because I separated the meatballs and sausage patties into ziploc freezer bags, I was able to pull them out of the cooler and let them defrost for 10-15 minutes before eating them). For the next three nights we camped in Jasper National Park. We spent each day exploring and adventuring around Jasper and Banff and spent as little time as possible at our actual campground, so here are some of the quick combination meals I came up with for dinner each day. I made a little extra each night to warm up in a pan on the propane stove for breakfast in the morning. 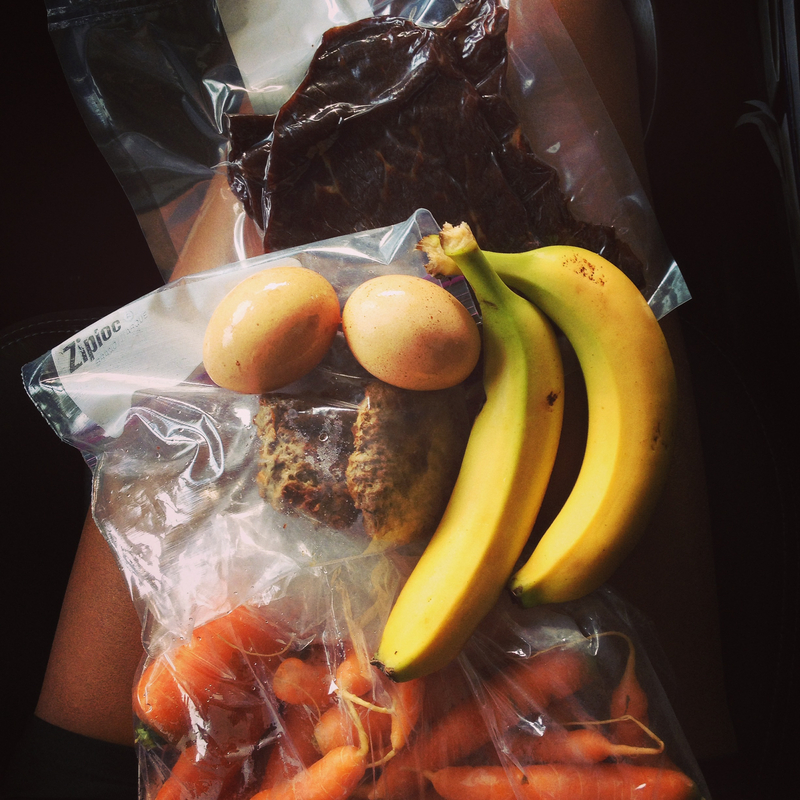 Lunch was always a mixture of eggs, veggies, jerky, Larabars, meatballs and sausage patties. I piled half of the stew meat on 2 large torn pieces of layered tinfoil. 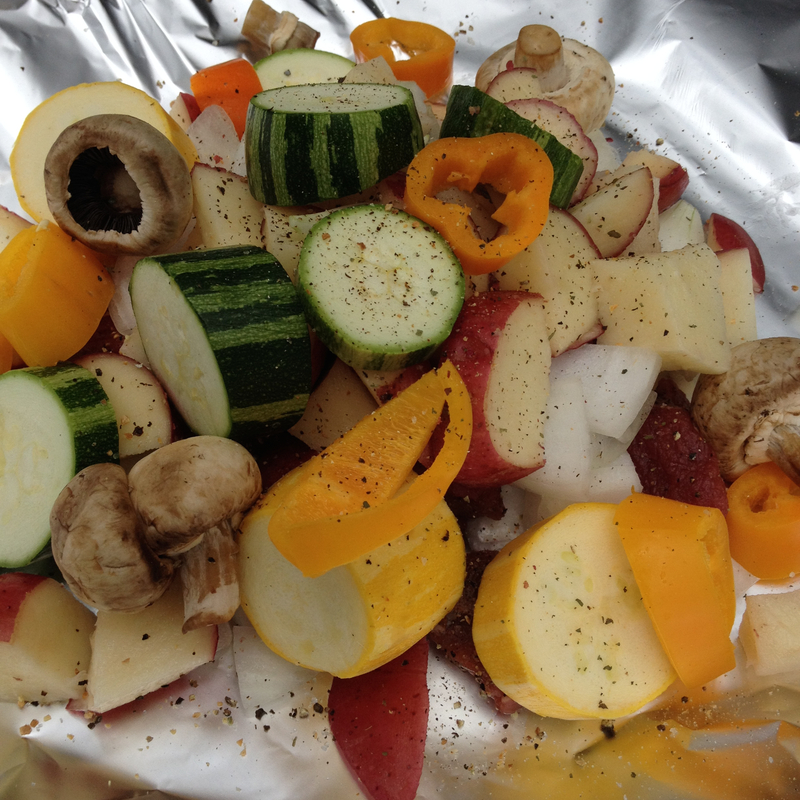 I sprinkled it with garlic salt and pepper, then added the diced potatoes, peppers, mushrooms, and zucchini. 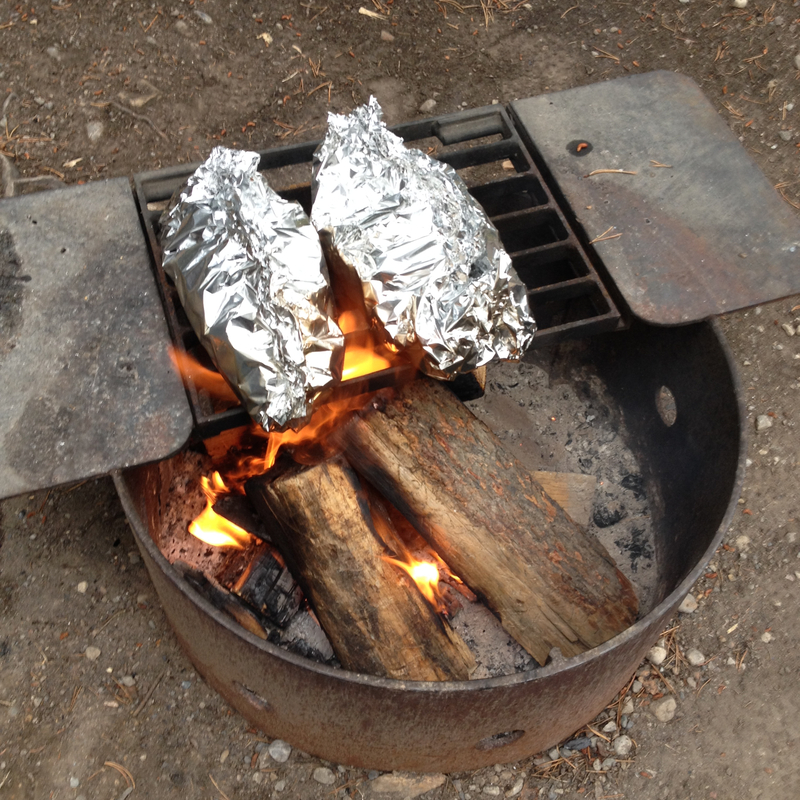 I wrapped it in the tinfoil and sealed it tightly at the top, and cooked it on a grate on top of the campfire for approximately 20-30 minutes. Depending on the size of your stew meat chunks and vegetables, check on it every 15 minutes or so until it’s cooked to your liking. We ate it right out of the tinfoil to save dish washing time. Some possible variations: throw in a splash of balsamic vinegar and olive oil, or steak spice. I did the same thing as the Steak Dinner, just replaced the stew meat with sliced farmer’s sausage. Farmer’s sausage usually has a high salt content, so skip the salt on this one and add chopped apple to balance the flavours. This cooks much quicker, so check every 10 minutes or so for doneness. If we had stayed longer, I would’ve done the same thing with a cut up chicken breast, pineapple, red onion and more vegetables. By making different combinations, you can have different flavours each night, all healthy and satisfying. Eating this way gave us lots of energy for all of our hiking and canoeing adventures, and left room for treats in the cute little town of Banff, at the Lake Agnes Teahouse, and the occasional S’more. If you skip the extra treats, the whole road trip and camping trip could easily be Whole30 approved. We are hoping to squeeze in another short camping trip before the summer is over, so leave a comment with some of your healthy camping ideas. I’d love to try them out!